I do all my lumber processing on my jointer/planer/table saw so I didn’t have the need to hold large boards on the side of the bench which might dictate a leg vise and/or sliding deadman. Furthermore any time I’ve needed to hold work to the top of the vise it was for light-duty finishing work like sanding or planing. This eliminated the need for lots of dog holes and holdfasts. The bench is made from #1 Southern Yellow Pine from Menard’s. Each top section was made out of eight 2×6 boards while the legs are from 4×6 timbers. The cabinet body is from 3/4″ ply while the drawers are 1/2″. After processing the top thickness is 5.25″; surely overkill but it’s certainly sturdy!! The bench’s height is 37″. I made it a bit higher than an average bench because I primarily do “detail” work on the bench not heavy work that would be better suited to a lower height. To arrive at this number I stacked up a bunch of boards onto my old bench and emulated working with various tools, noting how much I had to bend at the waist or how much my shoulders hunched up. 37″ seemed to be a good fit for me. The rails are joined into the legs using mortise and tenons. Similarly the legs are joined into the top using mortise and tenons. There are four 1/4″ lag bolts driven from the underside of the top rails into the bottom of the top. Because the rails are about 4″ wide I bored a large access hole halfway through (wide enough for the bolt + washer) and then drilled the remaining half with a 5/16″ hole. 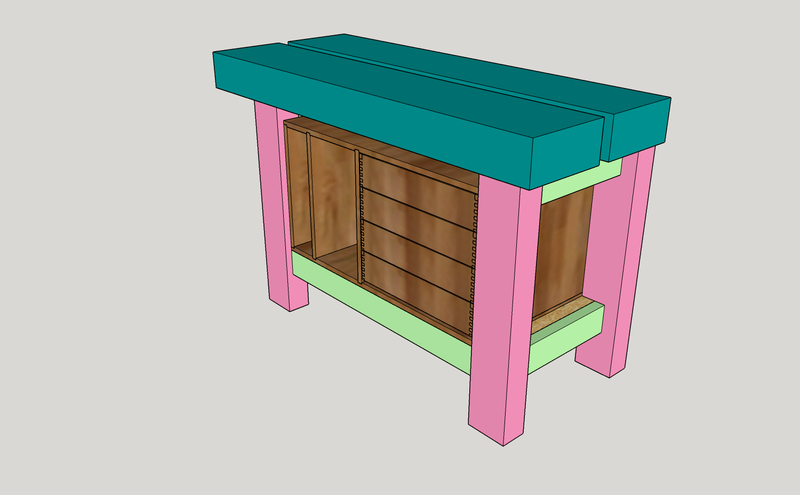 Here is my Sketchup model showing more of the internals. My assembly is more or less a copy of what Bill Schenher did with his split top bench. The two top pieces in my bench are version 2.0. Initially I ordered 2×10s, let them acclimate for about 2 weeks, and then ripped them in half. This was following the wisdom that wider boards come from better trees and this will have straighter grain and fewer knots. The ripped pieces developed some pretty wicked bows; a few even needed wedging just to be ripped because they pinched the blade so badly. This bowing made the resulting glued lamination fairly uneven although I should have used a few cauls to keep everything more aligned. So next I tried to joint one face flat, and then due to my jointer’s outfeed table coming out of alignment with the cutterhead I would up making a taper in one of the sections; 4″ on one end vs. 5″ on the other. I was pretty pissed off at this point so I scrapped these two sections and ordered the 2x6s that wound up in my final build. And in the 2×6 glueup I did use a few cauls just to get everything very well in line. With the 2×6 tops I simply skip-planed them; getting one side mostly level with a hand plane and then running them through the planer. This was much less error prone and easier than trying to run the huge pieces over my jointer. So if you are going to use 2×10 or 2×12 pine material for a benchtop have a few cauls ready for your glueup because you’ll likely need them to eliminate bowing. Mount the vise to the right of the leg and use an extra-wide vise jaw to reach way out to the left edge. The second option seemed like it would have problems with a too-long jaw and flexibility there so I went with the overhang route. I was concerned with the flex on the top in this area but the extreme thickness of the top totally negated that. It’s very solid all the way out. However another negative of the overhand is that by moving the legs together you loose storage space under the bench. I mortised the inner vise jaw into the bench drawing inspiration from this FWW video. However I incorporated the mortised-out front board into the benchtop glueup; only time will tell if I regret that decision! 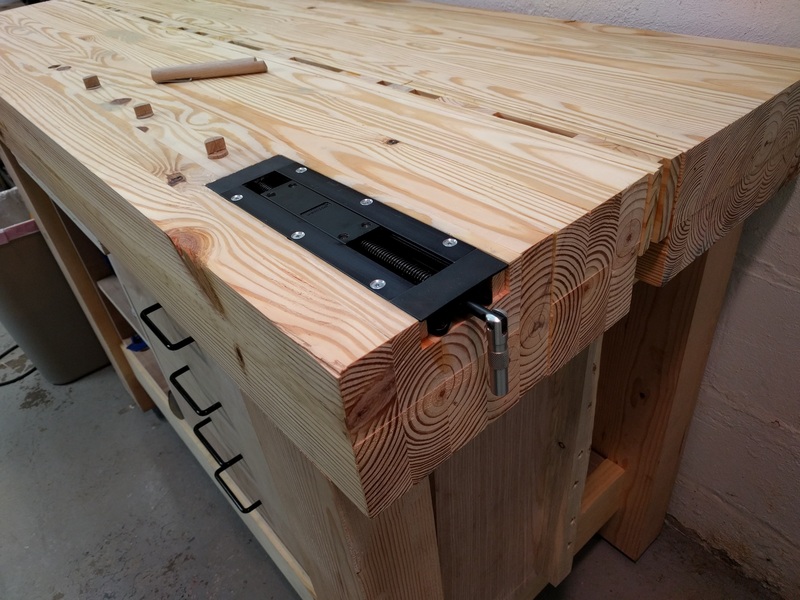 I’m glad that I went with the “front flush mount” style of vise mounting, where one can use the entire front of the bench as a uniform clamping surface. 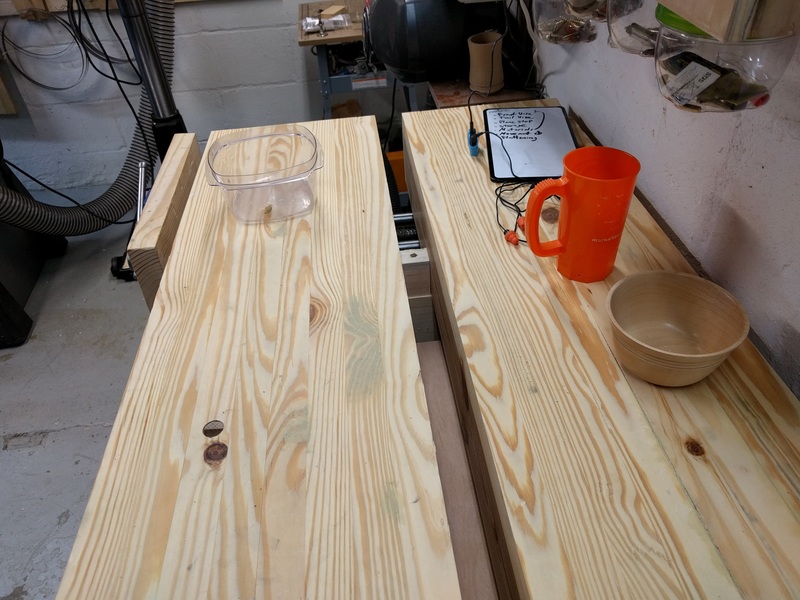 In the few weeks I’ve been using the bench I’ve already needed to hold a large-ish piece of plywood on the front of the bench. In retrospect I wish I would not have used such a large vise; it is overkill for my needs. The actual width of the 10″ model is 10.5″. I think that a 7″ vise would have been totally sufficient and it would have let me move the leg 3″ to the left giving me a little more storage area. For holding work to the top of the bench I went with Veritas’s inset vise plus some 3/4″ round dogs. I considered making my own wagon vise or the bling bling option but went with the inset vise because it didn’t require any fabrication and had very simple installation instructions. I’m very happy that I went this route because after spending a few weekends making bench I was very much ready to move on from the project and make stuff not just shop furniture. It took about an hour to install but that’s only because I screwed up and routed out a cavity the full width and depth of the vise. Two spacer blocks filled in those voids and all was well. I put in four bench dogs spaced 7″ apart. They are made from a 3/4″ oak dowel with springs as Mr. Sellers shows in this video. The centerline of the vise is about 2.5″ from the edge, I wanted to be able to comfortably sand/plane narrow pieces but also to be able to hold larger pieces more towards their middles. The inset vise / dog combination works very well, I’ve used it a few times and it holds things rock-solid. In addition on this side of the bench I left a small-ish overhang in case I ever need to clamp something over on this side. Between the two top sections I left a 1.75″ gap. This number I derived from the size of my largest clamp’s head for when I need to clamp something to the front of the top. Filling the gap is a plane stop / tool storage board. In plane stop mode it protrudes about 3/8″. I’ve used the plane stop once and it worked fine, but I imagine that I’ll primarily turn towards my inset vise for those tasks. What surprised me was the utility of the tool storage, I didn’t think I’d use it much. But when the bench gets crowded with stuff, especially stuff that you’re actively using, it’s really handy to be able to store a chisel/screwdriver/saw/whatever into a slot instead of having it get in your way. The open area to the left of the cabinet holds larger things that I use on a regular basis (glue/gloves/garbage bags/WD40/…). It has an adjustable shelf. 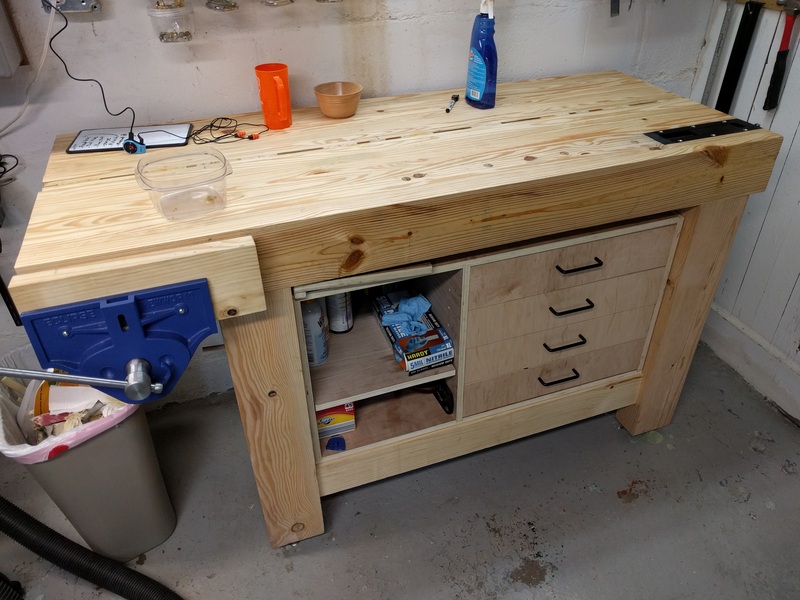 About two weeks after the bench was assembled I flattened the top using the process outlined in this Chris Schwarz article. The top sections were very flat & square after their initial run through the planer but after those two weeks they each cupped a bit. So I flattened the bench using a 5-1/2 plane. Two weeks after that one corner of the bench cupped a bit more.. showing that my lumber wasn’t dry & acclimated. This was in the Fall, so I waited until Spring to let the wood continue to dry out at which point I flattened it again. Also, the back section developed a pretty healthy crack which tells me that holes I put into the aprons for the lag bolts likely didn’t give the bolts enough room to move around. But then again had I let the boards dry out more the bolts would not have needed to dry so much! A workbench is a very personal thing, it needs to be tailored to how you work and what you do. I’d recommend using a very simple work surface for your first few projects before you jump into building your own bench. That will tell you what you actually need from a bench not just what other people on YouTube are using. Due to the storage cabinet it does not work well for a seated tasks – your knees can’t go underneath the benchtop.